Hey bunnies! Ohhh y’all. Are you ready? Let me ask again. ARE YOU READY?! The Epiphany starts tonight at 10pm SLT!! Eeeeeee!!!! I live streamed yesterday while walking around The Epiphany so I could show things, but if you didn’t catch it, naturally I’ll have lots of posts coming up! 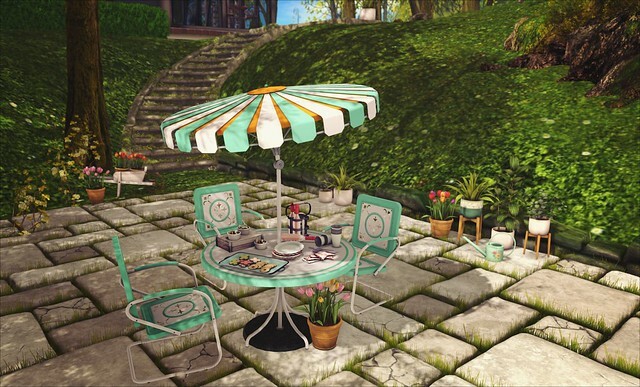 I fell right in love with the Pop Diner set from Belle Epoque! The cutie dress, shoes, glasses, and hat are just everything! The little matching tray is just the perfect touch, too! Also at The Epiphany, Ayashi has the Sienna hair! Now this set does come with some options, like other pigtails and also some accessories. I love it! Remember, The Epiphany starts at 10pm tonight, Saturday the 15th! Happy shopping! Pose Fair opened up today!! I’m so dang excited for this event, I can’t even tell you. I’m using one of the poses from the A Pirate’s Life set by Le Poppycock. They are seriously one of my favorite stores for poses with props! This set is unisex, so guys, you are definitely not left out! Collabor88 is really wonderful this round. My gorgeous side ponytail is called Feels Like Tonight and is by Exile. I decided a pretty light pink was perfect for this pirate today!